Viewing 1 current event matching “animation” by Date. Blender is a free, open source 3D creation suite. This class is an introduction to Blender. Learn how to navigate within Blender, create and edit simple 3D models, and add basic lighting to your art. Take this class as many times as you'd like. Bring a project—there will be plenty of time to work on it! Viewing 25 past events matching “animation” by Date. Light Troupe, a local Portland movement, exploring the boundaries of entertainment and audio visual simultaneous interactivity while drawing in the 4th dimension. For the programmers in the audience, Luz Studio, OpenGL and Ruby will be discussed. For the visual and audio artists in the audience, there will be an opportunity to play while interacting with the code the developers write on the spot! Wacom Tablets, Wiimotes and MIDI devices will be used as a means of interface. That means you can expect to see 2D drawing in 3D space animated over time A demonstration with at least a 4-person, simultaneous drawing to be followed by live audience participation! This is super fun stuff; computer graphics, music, animation, spontaneous creativity, happy excited people - come see for yourself and participate! SIGGRAPH events are non-profit. It is free for SIGGRAPH members and $5 for non-members, and includes lots of tasty food! Please register at EventBrite so we know how much food to buy! WHO: Jeff Paries Jeff Paries is the lead Silverlight developer with Waggener Edstrom Worldwide, a leading integrated communications company. Jeff has a strong background in 3D graphics and animation and is also an accomplished author and instructor in that area — he has authored several books and numerous magazine articles related to 3D. An early adopter of Silverlight, Jeff’s interests lie in developing animation concepts and methodologies within Silverlight. As a developer with design experience, Jeff’s mission is to help bridge the gap between design and development. His latest book, “Foundation Silverlight 3 Animation” works to further this goal through a scenario-based approach. TOPIC: Procedural Animation in Microsoft Silverlight Come and see how trigonometry and trigonometric functions can help us create movement in Microsoft Silverlight. Trigonometry is the study of how the angles and lengths of sides of triangles relate to one another, and is quite useful in programming Silverlight applications. We'll talk about how to apply trigonometry within Silverlight to create free-form rotations, calculate the distance between objects, use Sine curves to create oscillating movement, and more. The math will be demonstrated in a scenario-based approach in order to make it easier to understand, even if you slept through math class. Warmup - Smooth Streaming w/ VideoRx At the beginning of the meeting (6pm) Robert Reinhardt, co-author of the Microsoft Expression Blend 2 Visual Quickstart Guide and the Flash Bible series, will present his latest online encoding service, videoRx.com. This service makes it easy to compress your video content at the highest quality and lowest file size. videoRx.com analyzes your uploaded source video and delivers the best compression for your content. videoRx.com can also create adaptive streaming content for Silverlight Smooth Streaming for playback on devices and the web. Animation Artists, it's time you got some.. Please come and show your latest! Reviews and praise provided by local animation professionals. 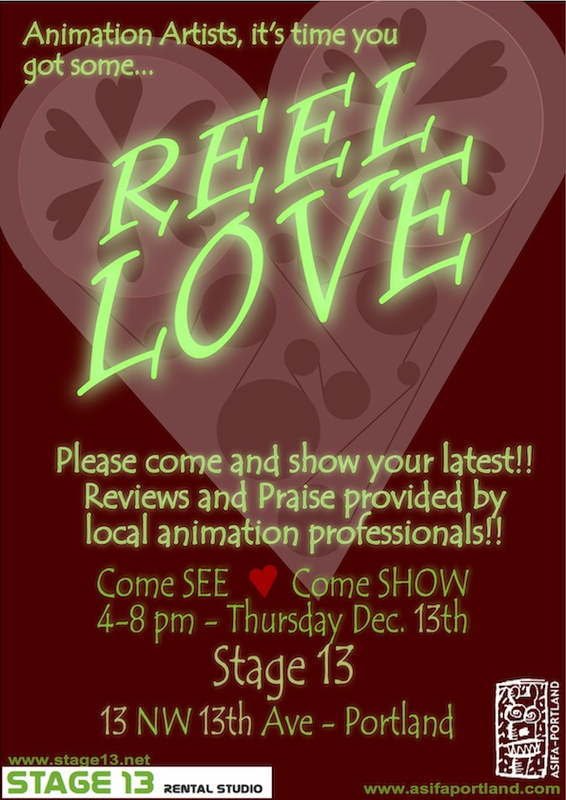 Come see the latest from local animators and show your newest stuff too! Open to Animators, Illustrators, Compositors, VFXers and other animation professionals. Bring your latest films to showcase for everyone. Join us for a day of learning about Information Architecture! You'd be surprised just how much all of our disciplines are connected. From UX to Architecture to Photography to Creative Writing, the design of information requires processes to create the ideal outcome for something that did not exist before. Meet fellow practitioners, get a better understanding of what others do and how you can use that knowledge to make what you do even better. Our lineup starts at 9a and ending at 6p, with one hour break for lunch. Come to one, a few or all! Your ticket price is good for the day, so you can come and go as you please. 9a: Kate Ertmann-Owner and Animation Process Expert at Animation Dynamics: Ethnographic Animation Talk related to the steps and practices involved in visualizing human-based research. 10a: Craig Peters-CEO, Awasu Design San Francisco: How to run a successful design review Presentation designed to illustrate the Information Architecture of professional interactions, story telling and project building. 11a: Josh Romberg-Photographer and Visual Designer: Image design as it relates to constructing visual content from both emotional and technical standpoints. 3p: Juliana Lukasik-TV Commercial Director and Owner, @Large Films Women on Women: It's Not What You Think Engineering product launches with not only the end consumer, but the purchaser in mind. 4p: Tyler Phillippi-CMO & Co-Founder at OnTheGo Platforms: Building a Company From the Ground Up: IA and UX become best friends. 5p: Michael Adcock-Technical Support Analyst at ProQuest: Fringe IA Scientific Discovery, Tools and Context, all of which contribute to making the unclear clear. In between talks, there are some great opportunities for networking, asking questions and uploading pix of the event. We couldn't be more thrilled to bring this content to you! -Amy Thank you very much to our sponsors! Refresh Portland presents... Creative CSS: Animations, Transitions & UX Workshop! Start thinking of CSS in a whole new light using animations, transitions, and transforms. Plus, learn how to make great UI animations while you’re at it! This workshop is for web designers and developers who want to add more sophisticated interactions and motion to their work. A laptop with your favourite text editor and modern browser(s) is all you need. A full day of learning! Snacks and lunch are provided and ISITE's guest wifi is plentiful and fast! You can find her on stage speaking at events like An Event Apart and encouraging others to do the same as the co-host of the Ladies In Tech podcast. She’s on the Future Insights advisory board, founded the popular Web Design Day conference, and leads workshops around the world on Animation for the Web and Creative Coding. Contact [email protected] with any questions about the workshop. Tickets can be refunded up until 2 weeks before the event. Tickets are always transferrable. Contact [email protected] with any ticket refund or transfer questions. Sep 17, 2014 Animation and the Future of UX! Since the Era of Flash, web animation has had a bad reputation: distracting, baroque, decorative, flash without substance. But with web and mobile sites adopting increasingly app-like interfaces, animation has become mission-critical to optimizing the user’s experience. Learn the science behind “tweening” and offloading mental models to the visual cortex. Discover the secrets animation studios use to coordinate massive efforts when designing in the 4th dimension. See all seven animation techniques working together on actual web sites people use today. Rachel Nabors has traveled the world spreading the philosophy and techniques behind web animation, and she’s bringing it home to Portland. Rachel Nabors is an interaction developer, award-winning cartoonist, and host of the Infinite Canvas Screencast. She deftly blends the art of traditional storytelling with digital media to “tell better stories through code” at her interaction studio, Tin Magpie. You can catch up with her at rachelnabors.com. Code Fellows invites online learners of all stripes to Code Oregon Labs! Last month we focused on coding for responsive websites, now let’s make ‘em dance! Gaston Figueroa of Uncorked Studios will kick us off with a demo on coding for animation. Gaston is a Front-end developer and a Creative Engineer at Uncorked Studios. He has a passion for user friendly interactive experiences, data visualization and creative code. After the animation demo, it'll be open lab as usual! Together with Code Oregon and generous volunteers from the #pdxtech community, Code Fellows is happy to host this event. Each month, our goal is a 6:1 tutor-to-learner ratio.